This page explains why the EcoStream store is being targeted by BHPSC and other pro-Palestinian activist groups in Brighton. It’s organised around key questions. Why target the EcoStream store? The EcoStream Store, located in Western Road, Brighton, opened in July 2012. The store is owned by Sodaclub, an Israeli carbonated beverage company with its main manufacturing plant based in the Mishor Adumim settlement industrial zone. Mishor Adumim is an industrial area attached to the residential settlement of Ma’ale Adumim, East of Jerusalem in the Israeli occupied West Bank. The store stocks a range of Sodastream products, and Sodaclub owns the Sodastream brandname. The Brighton store is the company’s first in the UK. Brighton was selected because of the town’s reputed support for ‘green’ initiatives and ‘green’ politics: Brighton & Hove City Council, for example, is currently run by a Green Party-led administration, and the city’s Pavilion ward elected the UK’s first Green Party MP (Dr Caroline Lucas) in 2010. The store promotes itself as environmentally-friendly by selling refillable beverage bottles and machines for making homemade soda water. Sodaclub has clear associations with the Israeli programme of illegal settlement expansion in the occupied West Bank. Its complicity in ethnic cleansing and profiteering has been carefully documented. How is EcoStream complicit in the ethnic cleansing of Palestine and Israel’s abuses of human rights and international law? The expansion of Mishor Adumim settlement industrial zone, where the main Sodastream factory is based, is encroaching on the land of the Jahalin bedouin, who are being forcibly relocated to a reservation in Abu Dis, next to the Jerusalem municipal rubbish dump. Palestinians living in the villages around Mishor Adumim are prevented from building any permanent structure under Israeli military orders. Their tents and huts, and even a primary school at Khan-al-Ahmar, are subject to demolition by the army (more details at www.scribd.com/doc/80963609/Amnesty-Briefing-Paper-on-Jahalin-Bedouin-forced-relocation). These building restrictions prevent the establishment of any Palestinian businesses, meaning that local Palestinians are forced to work in the settlements. Palestinian agriculture is limited by the settlements monopoly on land and the restrictions placed on the grazing of cattle, often leading to the seizure of cattle by the army (see http://english.pnn.ps/index.php/politics/2410-the-occupation-confiscated-cows-in-the-northern-jordan-valley). Doesn’t Sodaclub provide much-needed employment for Palestinians in the area? If EcoStream is environmentally-friendly, shouldn’t I support the store? ETHNIC CLEANSING IS NOT GREEN! Sodastream’s healthy modern eco-image disguises the fact that it has set up its factory on land confiscated from Palestinians. The Israeli government gives them tax breaks and legal support to work there. For its part the company uses the ‘Made in Israel’ label to hide the fact that the products are actually made in illegally occupied territory. A 2011 United Nations report states that Israeli government policies are destroying Palestinian agriculture and industry by confiscating land and natural resources, restricting the movement of people and goods and isolating them from international markets. Sodastream’s factory is in a settlement industrial zone which is expanding and taking over Bedouin land. The Bedouins themselves, the native people of Palestine, are being forcibly relocated into ‘ghettos’ by a rubbish dump in East Jerusalem. Sodastream itself recognises the dangers of negative publicity and a boycott of its product but prefers to stay in the occupied territory and enjoy the favourable tax breaks and economic incentives. It is up to us to show them the price of their illegal and immoral activity. So what’s been going in in Brighton? Since shortly after the EcoStream store opened it has been the focus of regular protests by local residents who strongly object to the presence of the store, due to Sodaclub’s clear associations with the Israeli programme of illegal settlement expansion in the occupied West Bank, and its documented complicity in ethnic cleansing and profiteering. These protests have taken place weekly, and sometimes twice weekly. They have attracted as many as 50 regular supporters. The protests are entirely peaceful, and make no attempt to prevent the store’s customers from entering or leaving. 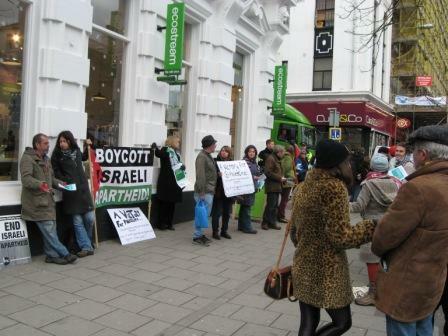 Protesters hand out leaflets, drawing the attention of local residents to the strong links between the store and Israeli violations of international humanitarian law, and attempt to persuade local residents to express their outrage by boycotting the store. The protestors encourage passers-by who support the campaign to collect additional literature, sign petitions etc. The protests are supported by a number of local and national groups, including the national Palestine Solidarity Campaign, the Boycott Israel Network, Jordan Valley Solidarity, and the Labour Representation Committee. In a statement on her website, Brighton Pavilion MP Dr Caroline Lucas has put on record her deep concern about the presence of the EcoStream store and the complicity of its parent company in human rights abuses, and her support for the protesters’ ‘right to demonstrate peacefully in the hope of persuading the company to think about moving their manufacturing plant elsewhere’. The EcoStream protests are part of a wider international movement for Boycott, Divestment and Sanctions (BDS), following a call in 2005 by over 130 civil society organisations in Palestine. The BDS Call urges a boycott of all Israeli companies until Israel complies with international humanitarian law, recognizes the fundamental rights of the Arab-Palestinian citizens of Israel to full equality, the rights of return of refugees and ends the siege of Gaza and the occupation of all lands occupied in 1967. The EcoStream protest is focused specifically on the Israeli programme of illegal settlement expansion, and the presence in the store of products manufactured on a key illegal settlement in the West Bank. Sodastream products also sold in the UK at Robert Dyas, John Lewis, Argos, Comet, Lakeland and some Sainsbury and Asda stores. These other outlets are also the focus of protests and letter-writing campaigns. EcoStream protest – write to your MP!